1. 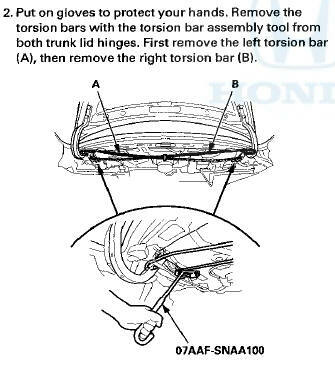 Remove the trunk lid torsion bars (A) from the torsion bar center clip (B). 3. Remove the torsion bar center clip (A) from the body. 4. Install the torsion bars In the reverse order of removal, and note these Items: - The shapes of the right torsion bar (A) and the left torsion bar (B) are shown. Install the torsion bars properly. - Adjust the torsion bars forward or rearward with the torsion bar assembly tool. - The torsion bars were Installed at the factory in the normal position as shown. - Make sure the trunk lid opens properly and locks securely.